This is the weekend for our Q2 show and yesterday was the day for setting up. 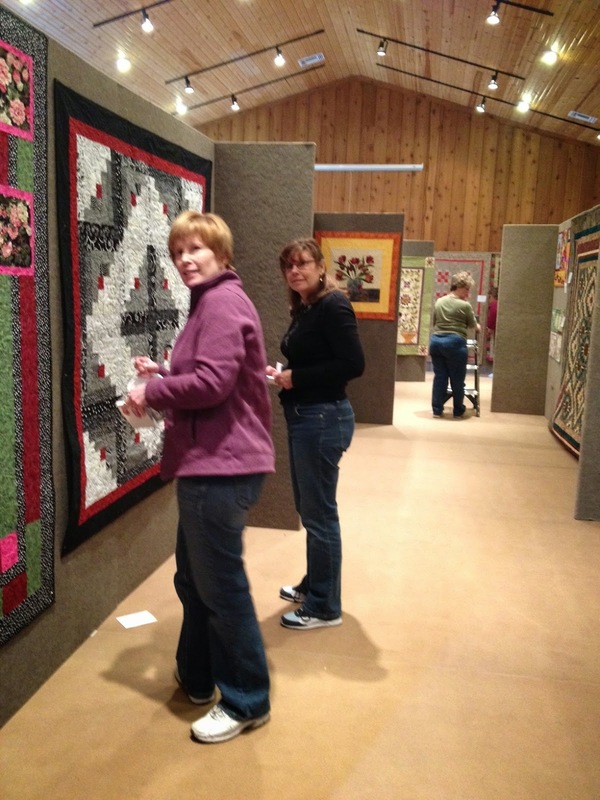 Here are Annie and Marilyn going around pinning the information per each quilt after the hanging. At the back is Mary Ann who is co-chairman with Johanna, not in the picture. Wednesday evening the able bodied quilters and some of their hubbies did all the setting up of the panels which is no easy task. I always marvel at how quickly the blank panels are filled with lovely pieces of work from our members. If you are here in Midland or close by, come see our show! It is today and tomorrow from 10:00 to 5:00 and Sunday from 12:00 to 4:00. Check out the guild blog, Pass the Tiara--there is a link that will take you there on my sidebar. I will be working this afternoon and Sunday afternoon. Have been working on the shows for probably 10 years and really enjoy it. 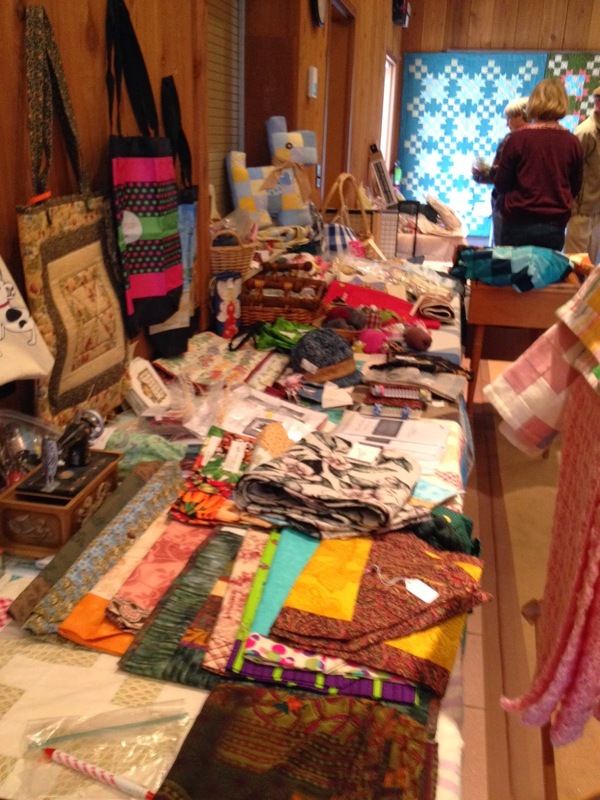 One of the most popular places at our shows is our bazaar! Here it is being set up yesterday. Everyone brings in no longer wanted items in the way of books, magazines, FABRIC!, notions and specially made items just for the bazaar. What a popular place! 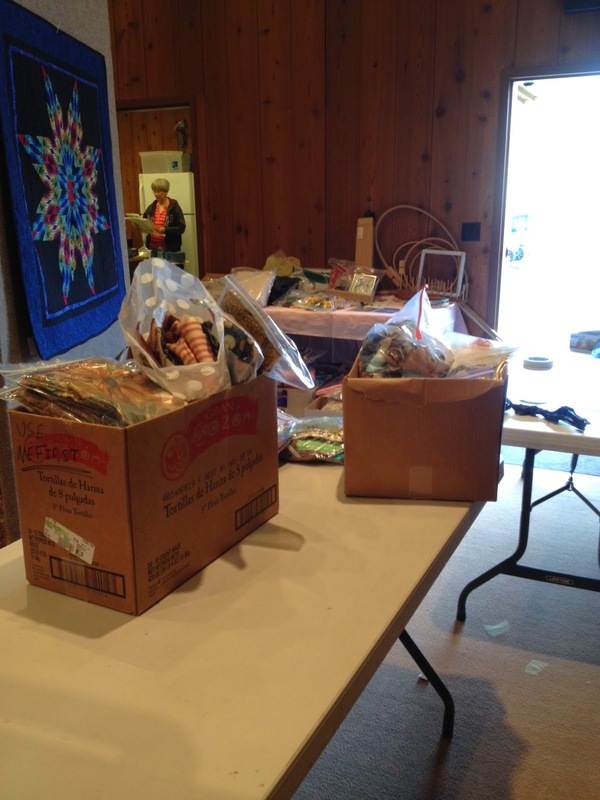 A quilt garage sale! Just a portion of all the good stuff you will find at our show. 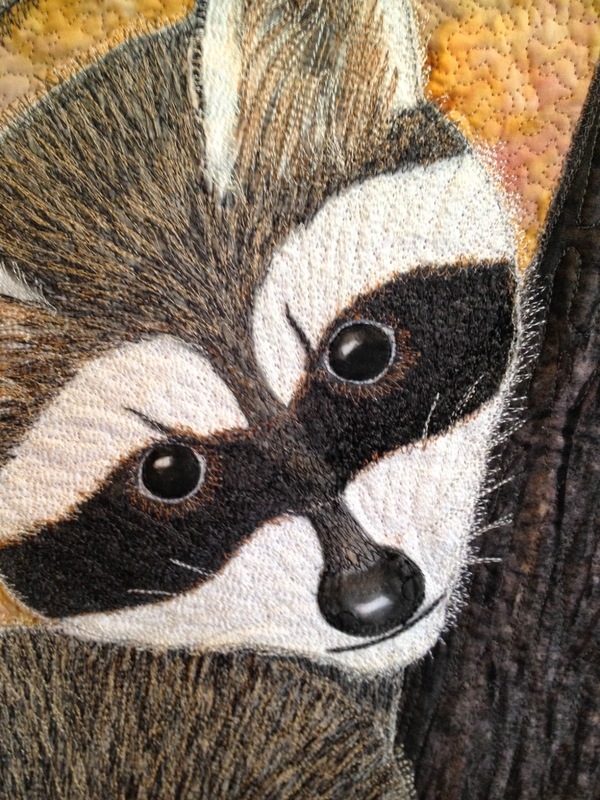 I am not diminishing the fact that you will be seeing some gorgeous quilts, also! It's all good!!!! More about this fellow in a future post!!!! And now, this is for Helle Reed in Denmark . Thank you, Helle, for visiting my blog! That is part of the fun of blogging is hearing from people from all over the world! Yes, there is a pattern for the star compass quilt you saw on my post about last year's quilt show. Linda McGibbon does absolutely gorgeous paper piecing and designs and prints her own patterns. Linda does awesome work - she does her designing on EQ7, the quilt software. She also has a website where you can purchase her patterns and here is the link: http://www.lakeviewquilting2.com/ Go there and enjoy the gorgeous quilts!! I hope you find this information - I could not find an e-mail address for you or a blog so will try contacting you this way. Can't wait to see the show! Be there Sunday! Thanks for posting the link to the Mariner's Compass, I had also seen it and wondered where to find the pattern. Love your blog and all the great pictures.